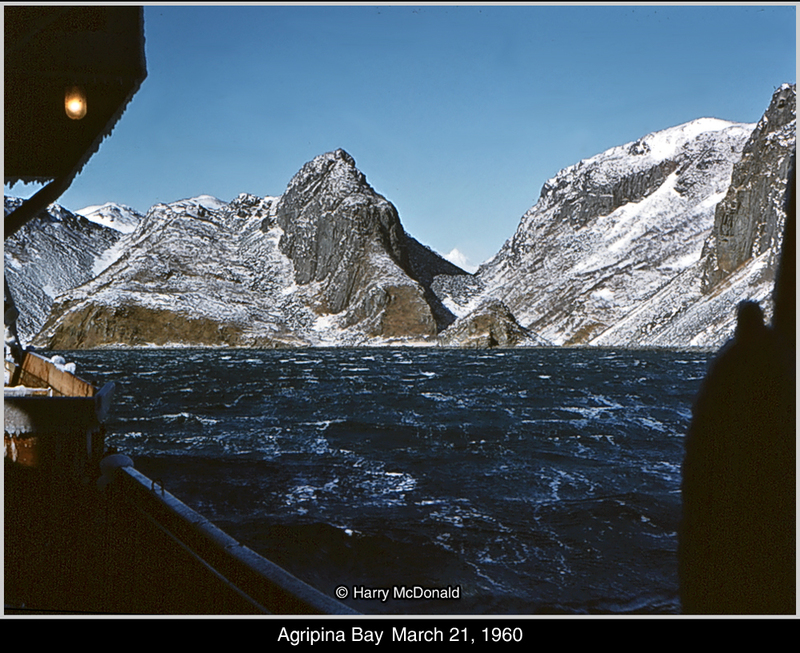 Prince Rupert, October 9, 1959. It's a "what?" 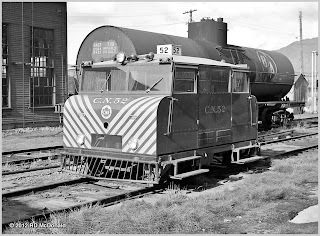 Canadian National Railways #52 was built by D. Wickham & Company, Worcestershire, UK. Powered by a Ford V-8, through a transmission box outputting to a chain drive. Jonathan Flood of the Wickham Yahoo Group informed me that this vehicle is correctly identified as a Wickham Type 40 Mark II Inspection Trolley. 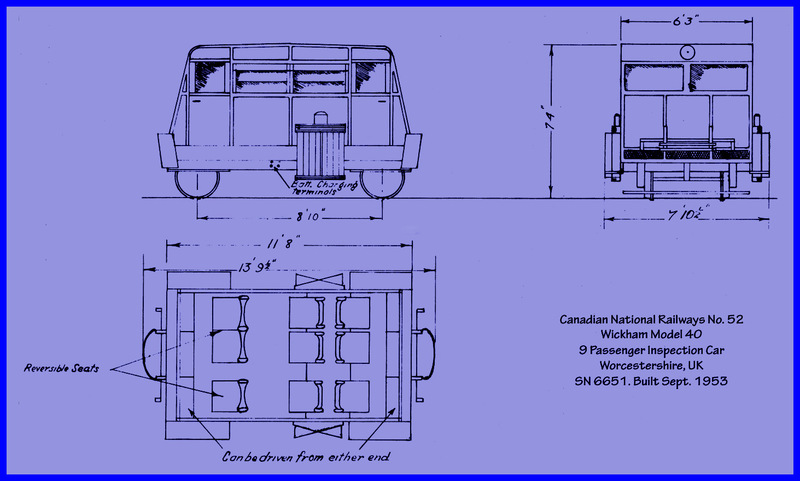 This inspection car had a capacity of 9 personnel in three rows of three across seating. 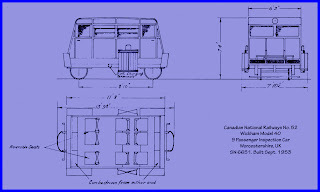 Full marker lights, head lamp and Number Board - er - box! There was a starter button, forward-reverse shift bar, and clutch. The next step down from this was the "speeder." I begged and begged for a ride in Number 52, but it never happened. Talking to the guys in the shop, they said "You really don't want to ride 'The Beast!'" They said it was loud, smelly, and rough riding! Used for track inpections, shunting track workers, and as a pilot car during stormy or snowy weather, running about 30 minutes ahead of freight and passenger movements. The Skeena Subdivision, any many others, was a war zone with mother nature. In the three years we lived there, there were five slide related derailments. 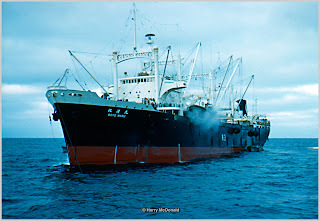 CNR 52 was painted the traditions CNR Green with gold lettering and white stripes on the bow. Wickhams were also manufactured in Goodyear, Texas. But information about this facility is hard to locate. Photos of other Wickhams here and here! Compare this rough rider with the Great Northern 1955 Buick Special in a previous post! Parked behind #52 is a tank car used to supply diesel to the Prince Rupert Engine Facility. The reporting mark (owner's i.d. 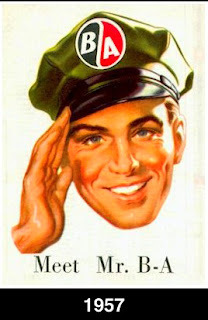 number used to keep track of where cars are located,) is BAOX 739, British American Oil Co. X = company does own the car, but does not own a railroad. "BAOX" was used between July 1937 through October 1957. The reporting mark was eliminated in April 1960. Tank Capacity: 10,354 Imperial Gallons, 12,425 US Gallons. 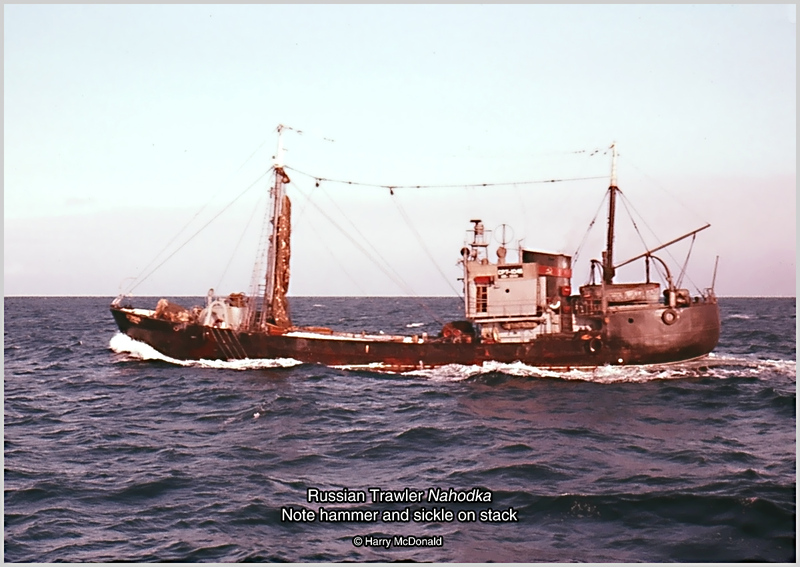 South African Wickhams - Including some electrics! 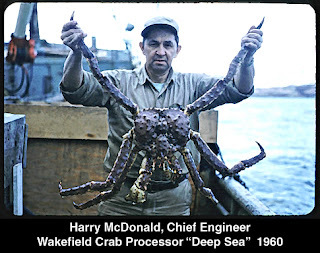 Before the Deadliest Catch: Part Four - "Connecting the Dots"
Part 1 - Back story on the history of the Deep Sea in relation to the King Crab fishery. Part 2 - Begins the narrative "Saga of the Deep Sea" as written by my Dad. 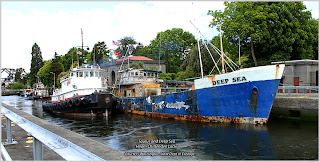 Part 3 - Conclusion of "Saga of the Deep Sea." 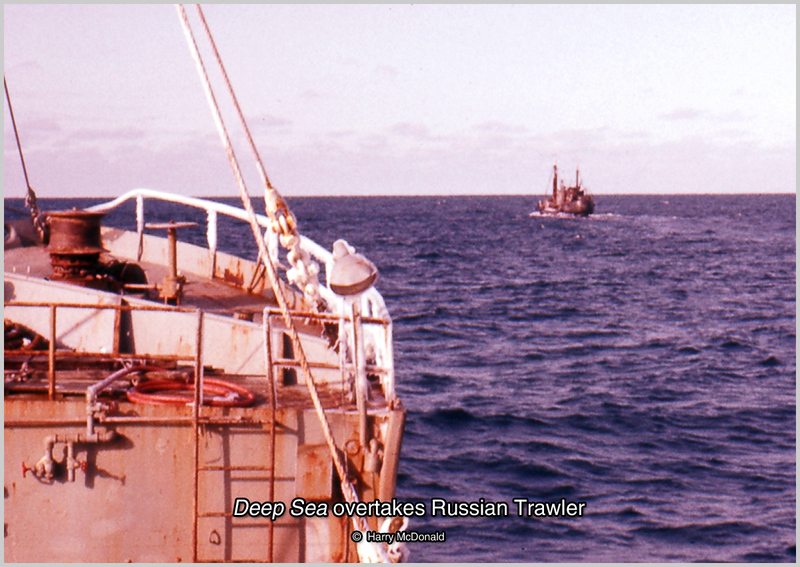 The subsequent life and times of the Deep Sea are unknown to me. 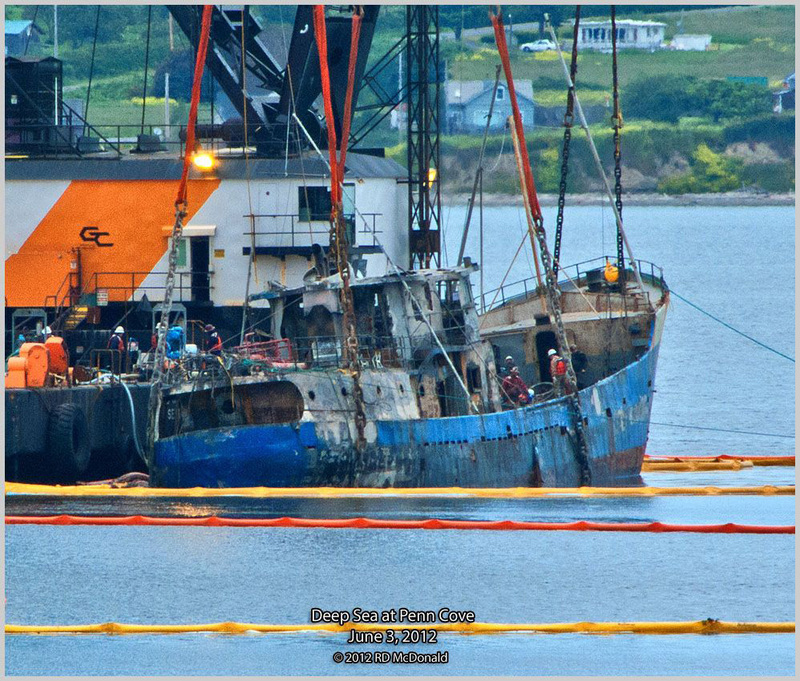 Once my Dad returned to tug boats, the past became the past. 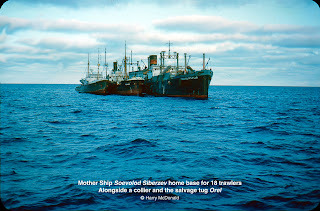 As I wrote in Part One, I was gobsmacked to learn that not only the Deep Sea was "still around," but that she burned and sank about 8 miles from me, as the crow flies. So here is what I have learned about how the Deep Sea ended up on a mooring buoy at Penn Cove, where she languished, much to the consternation of the residents of Coupeville, Washington, and the owners of Penn Cove Shellfish, where the derelict was close aboard. 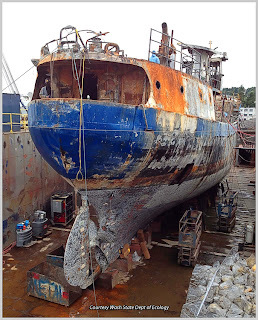 As I understand it, a fellow by the name of Rory Westmoreland, a Renton (Washington State) scrap dealer, bought the 65-year-old Deep Sea through a Craigslist ad posted by the Port of Seattle. The Port seized the Deep Sea in 2010 after the previous owner, Factotum Fisheries, fell six months behind in moorage fees at Fisherman's Terminal in Ballard Washington. 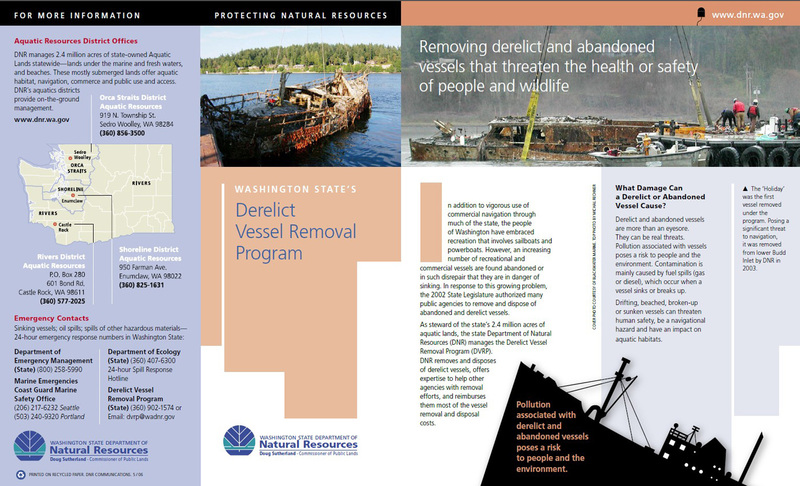 Washington State has a derelict vessel removal program. While the State had contacted Mr. Westmoreland, and began sanctions against him, the vessel caught fire and sank, May 12-13, 2012. She ended up resting at approximately 60 feet. 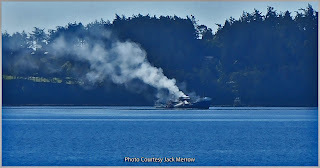 This was the scene at Penn Cove, Sunday afternoon June 3rd, 2012. 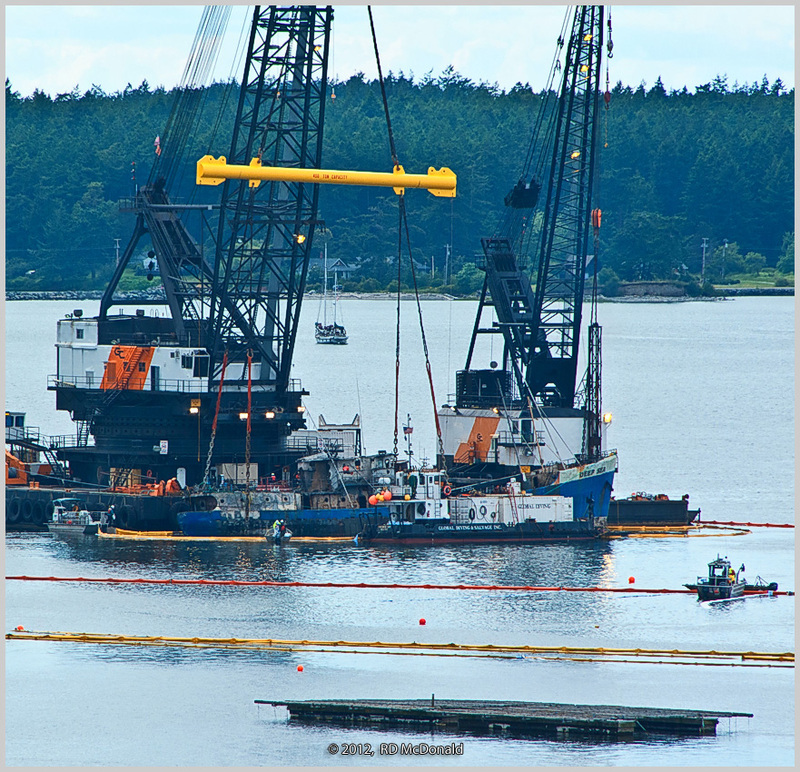 Two General Construction Company (Seattle) barge cranes, one 300-ton capacity, the other 100-ton capacity, tended by the Island Tug & Barge (Seattle) Island Voyager, are struggling to lift the Deep Sea from the muddy bottom of Penn Cove. 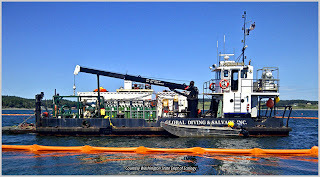 A dive tender - Prudhoe Bay - from Global Diving & Salvage was alongside. 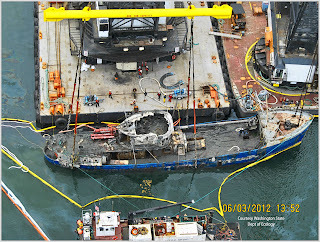 She was the primary support vessel from which the team of divers operated. 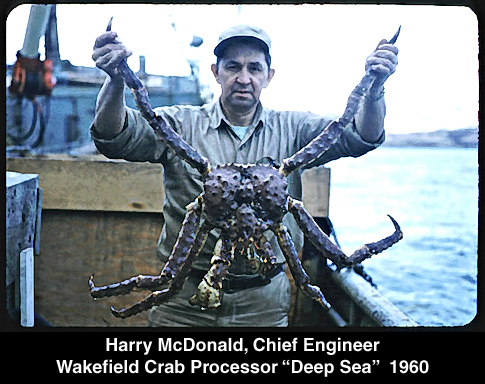 They burrowed under the Deep Sea using high-pressure water jets to burrow beneath the vessel. 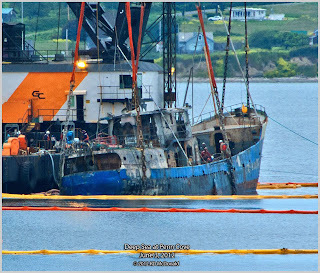 Chains were past under the hull, creating slings under the bow and stern to accomplish the lift. 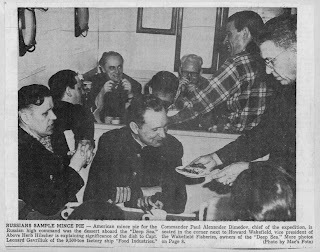 You can see why there was such concern about the livelihood of the muscle farm. 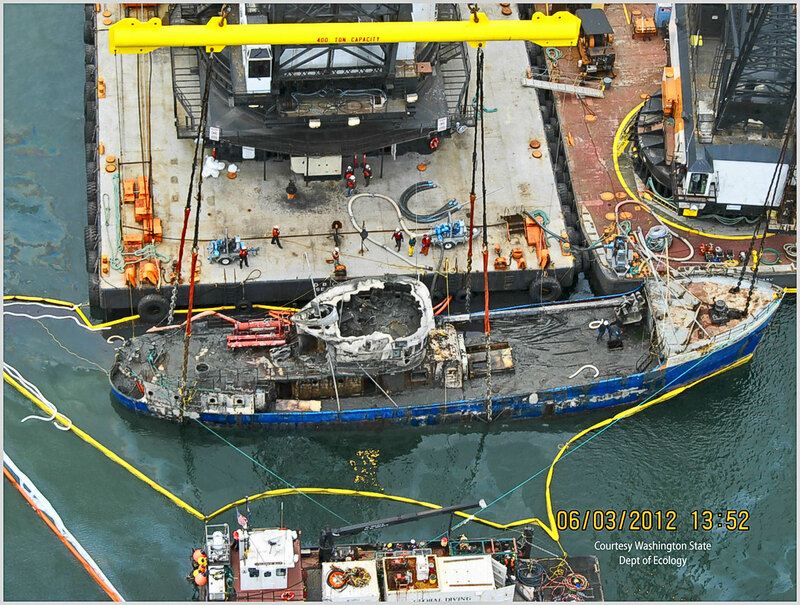 The darned vessel was anchored close abeam! There were many people lining the bluff, with cars parked precariously on a basic road with no shoulders. A least one TV station, had a microwave truck set up, and the normally peaceful Penn Cove was insulted with a variety of news choppers circling overhead. 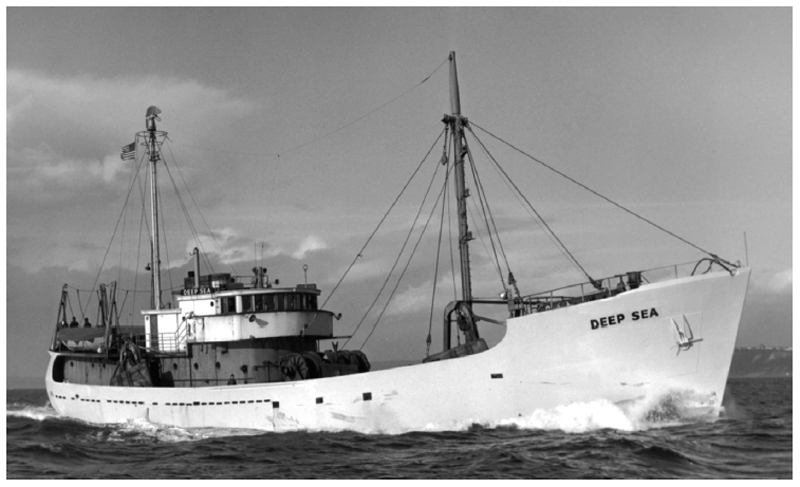 • Deep Sea Trawlers, Inc.
• Birchfield Shipbuilding and Boiler Company, Tacoma Washington, went out of business in the early 60's. • Lowell Wakefield passed away in 1977. However, a mountain on Afognak Island memorializes him. 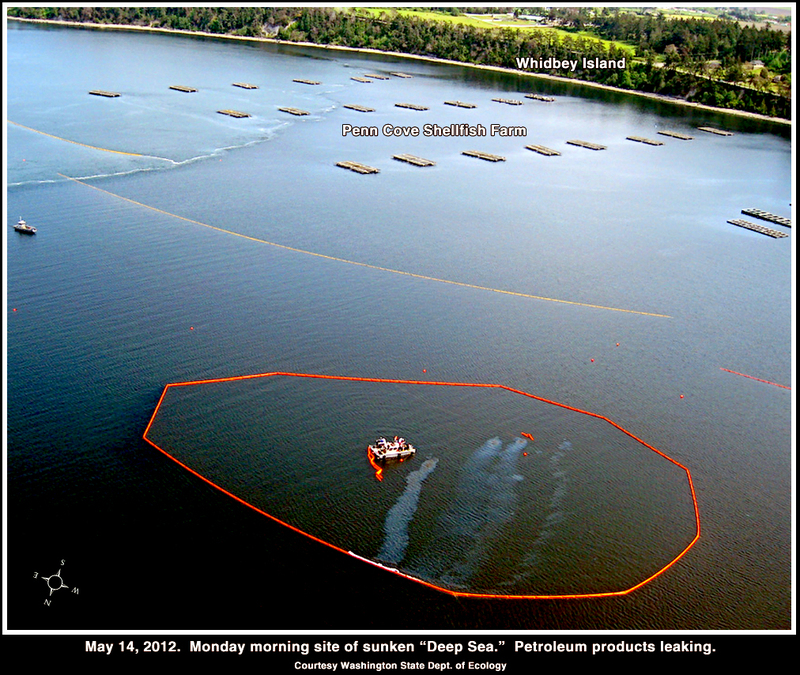 • The Deep Sea was consumed by fire and sank in Penn Cove, Whidbey Island, May 12-13, 2012. As of this writing, the cause of the fire has not been made public. 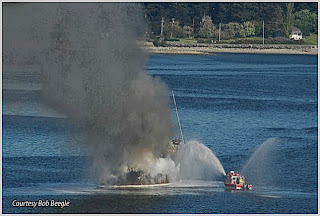 There was no one living aboard at the time of the fire. • Wednesday June 7, the 2,250 hp Taurus (Dunlap Towing, Seattle) passing through Hiram Chittenden Locks in Seattle, delivering the Deep Sea to Stabbert Maritime Yacht & Ship in Ballard Washington for dismantling. • June 13. 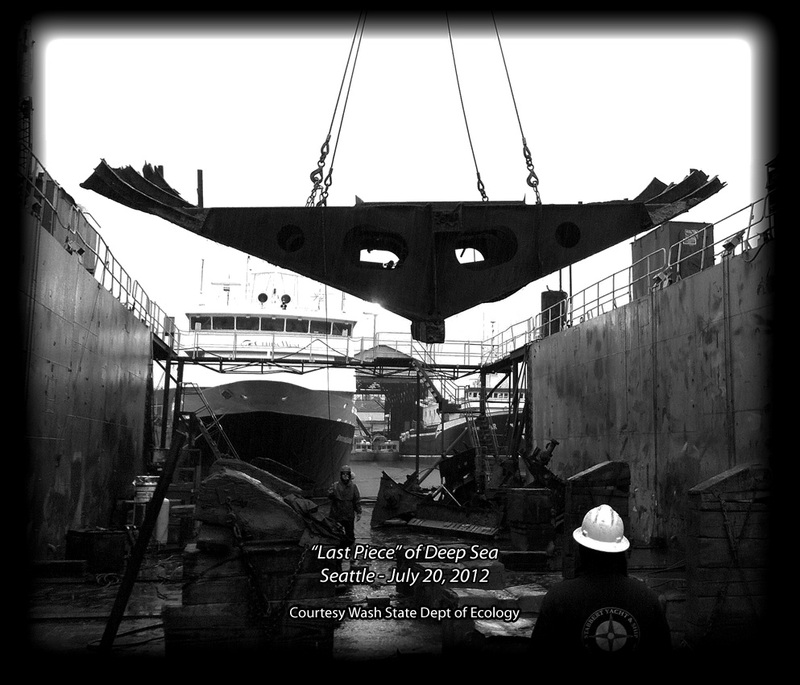 Work began to dismantle the Deep Sea. • July 20. Final piece of hull lifted out of the dry dock. 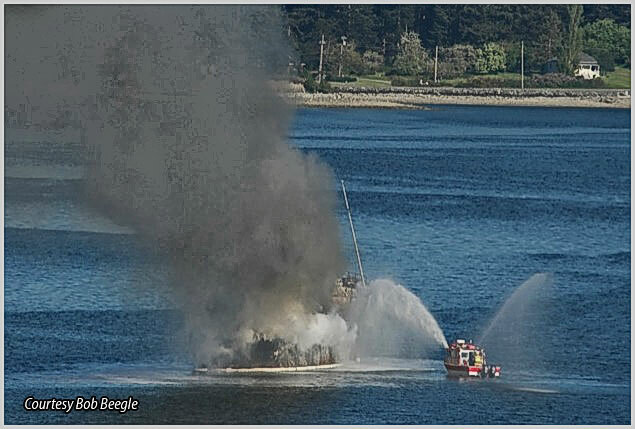 And so an important vessel in Pacific Northwest maritime history is gone. 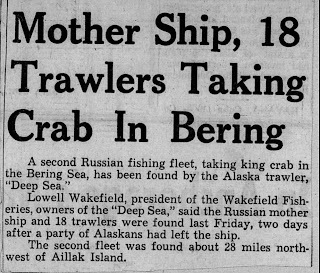 Built as the first trawler for the Alaskan King Crab fishery, and soon converted to become the first floating King Crab processing vessel. Played a major role in bringing representatives together from the United States, Russia and Japan for the purpose of establishing harvesting boundaries and regulations. How fortunate for us that my Dad took that posting. 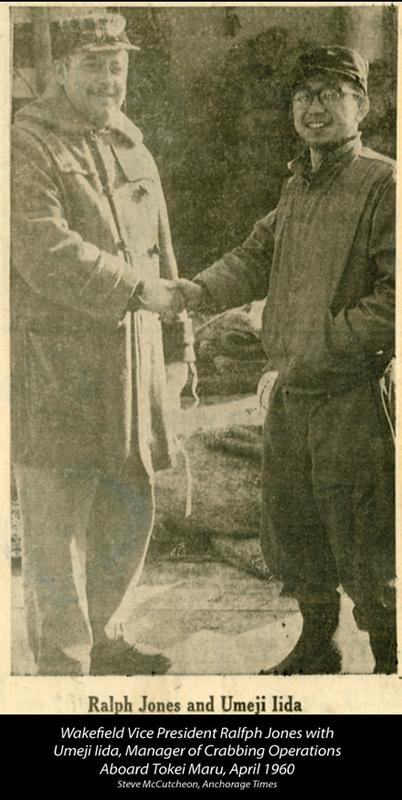 I am very pleased to share his story with you. 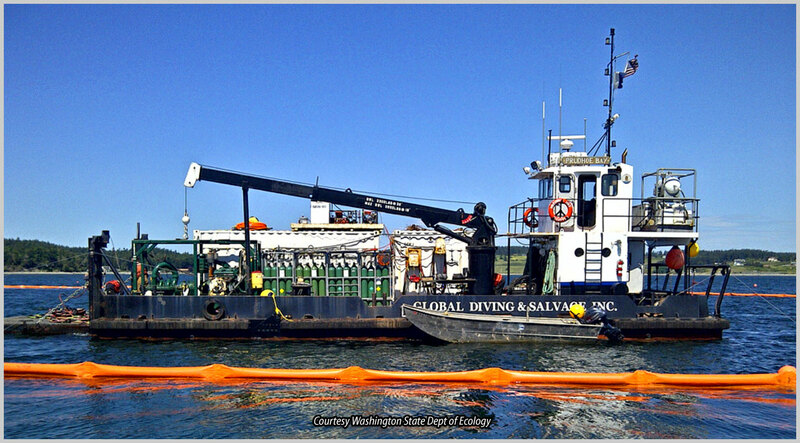 Finally, I appreciate access granted to photos by Larry Altos, Washington State Department of Ecology. Without the photos, I could never have visualized this story so completely. 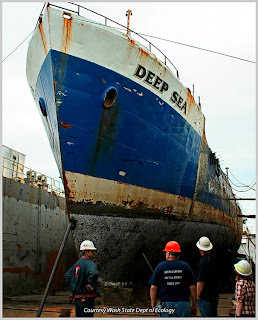 Deep Sea Saga — Final Word! 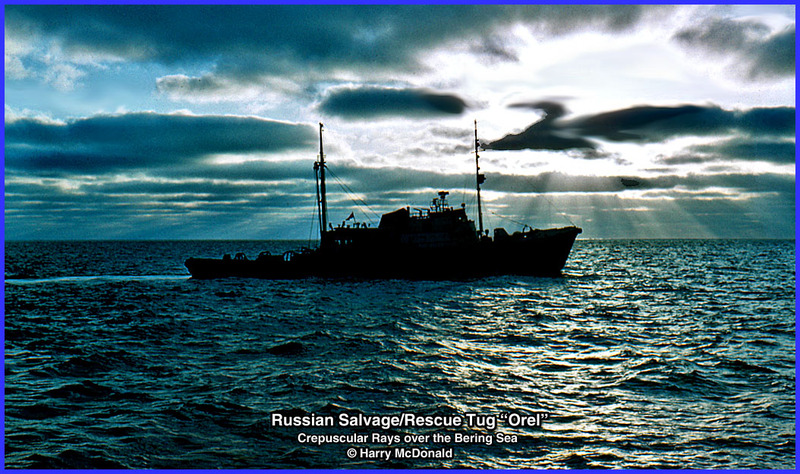 After scouring the sea for two days and nights contact was made by following a Russian trawler loaded with flounder on her way back to the main fleet. 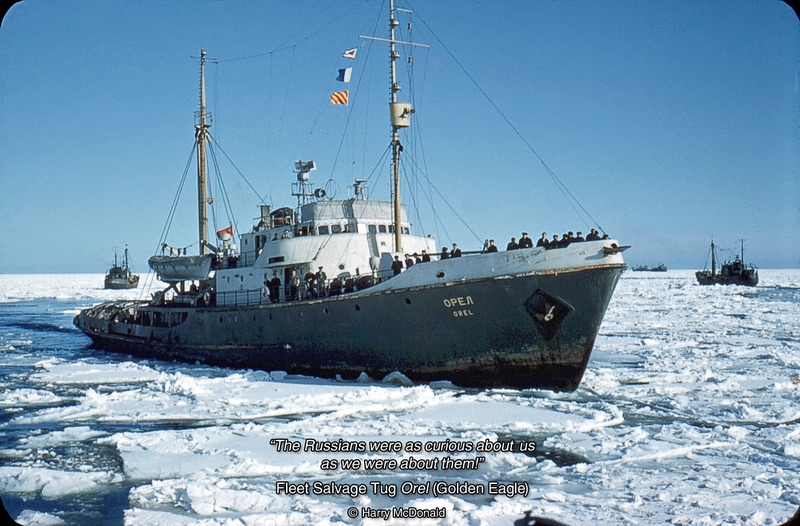 Pulling alongside, the Alaskans hailed the Russian with the aid of a bullhorn. Alexander Shadura of Anchorage, the parties interpreter spoke in Russian. He said something like "Take me to your leader." 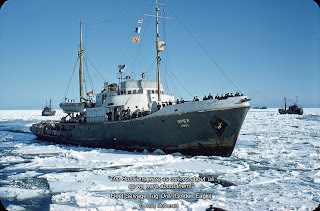 The Russian captain had no objections and bade us to follow him to the main fleet located 61 miles due north. 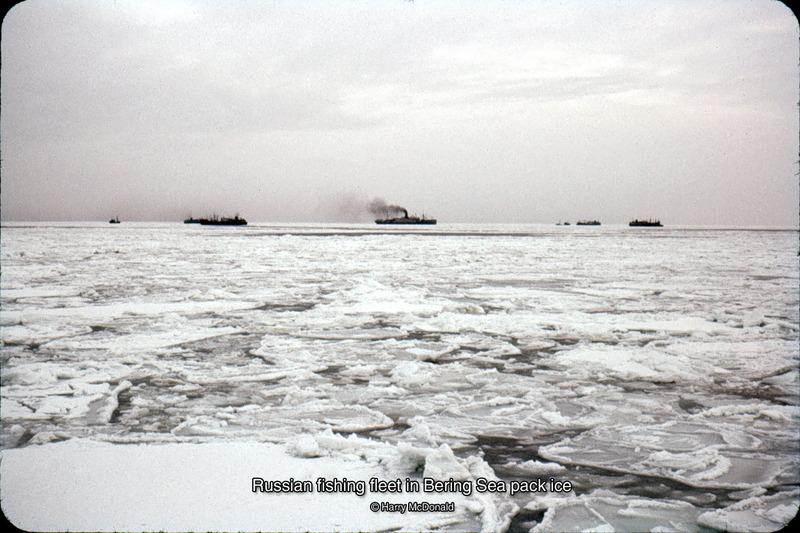 The Deep Sea fell in behind the Nahodka and for 11 hours followed her through the drift ice and at dawn came upon the Russian fleet. This consisted of a Mother Ship, rescue tug, cargo ships reefer ships and trawlers, 58 in all a floating city of some 2,500 people. The Mother Ship, Food Industries, a former Lamport & Holt Trans Atlantic liner Vasari, built by Raylton Dixon in 1909 at Middlesbro, England. 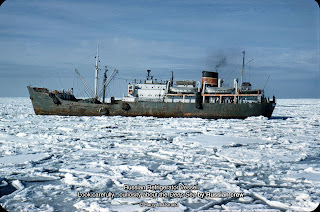 Read "There's Nobody Here..."
I know very little of the history of this vessel other than that she made six voyages on the Liverpool - New York run and subsequently under the name Artic Queen. 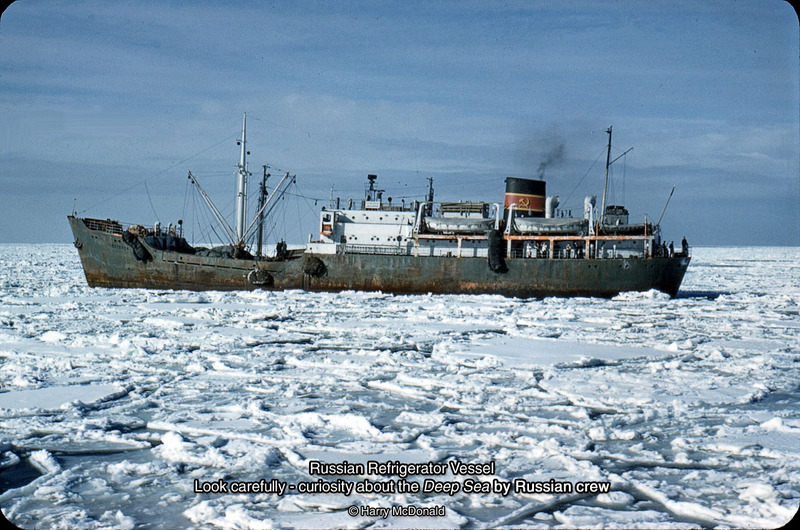 When she was sold to Russia, the ship was converted to a refrigerator ship. 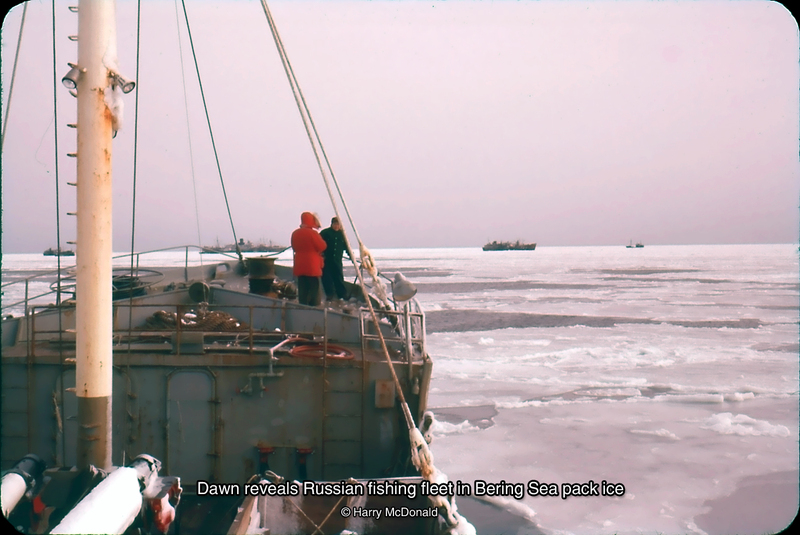 The Russians have been fishing in the Bering Sea since 1959 and theirs is unique method of fishing. 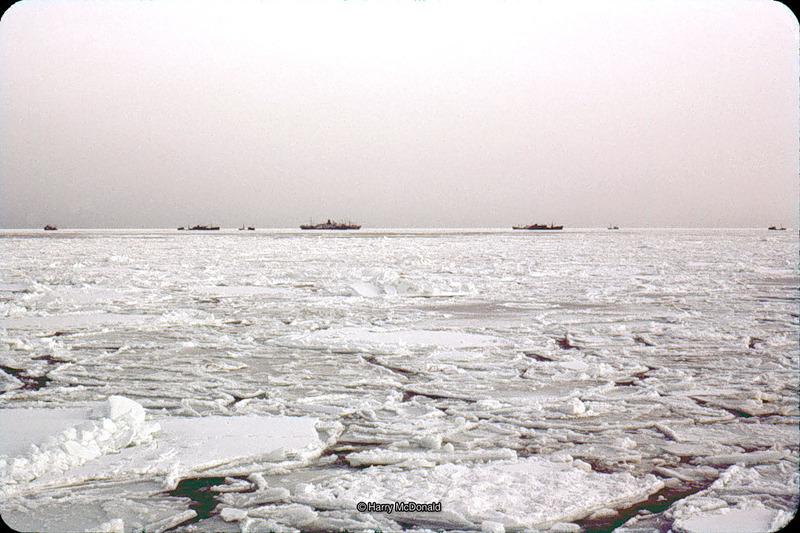 They stay in the ice because it keeps the sea calm, the ships can lie side by side without damage by scraping. 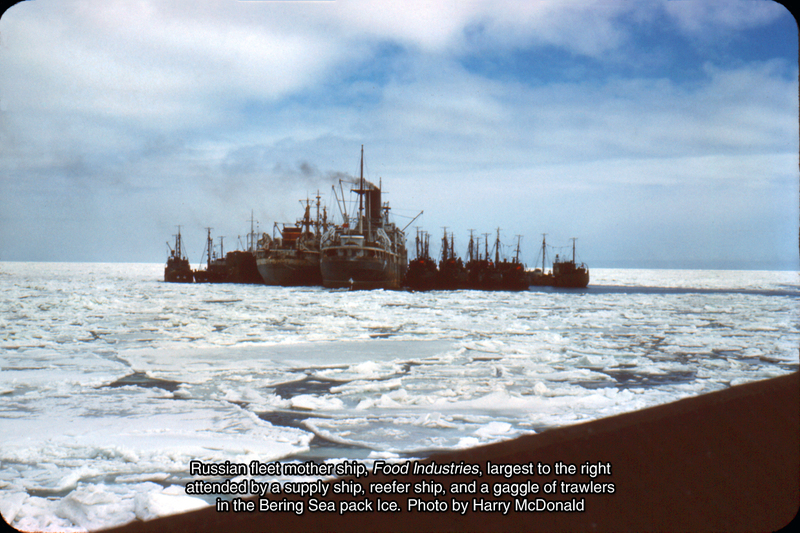 The supply ships from Siberia can lay along side and transfer cargo and load on frozen fish. Our party going aboard the Mother Ship consisted of Howard Wakefield of Wakefield Fisheries, Seattle, Dr, William A. Smoker, Chief of the Alaska Fish and Game Commission, Tak Miyahara, research Biologist of the U.S. 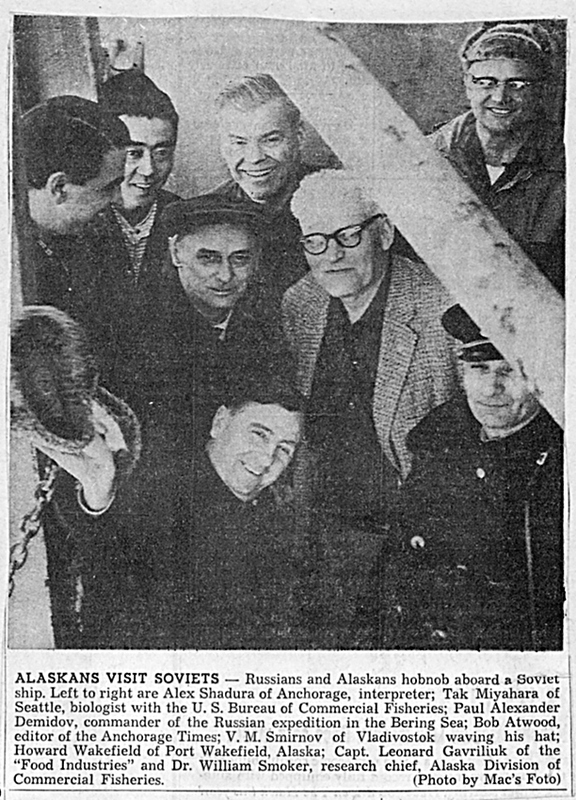 Fish and Wildlife, R. Atwood, Editor of the Anchorage Times, Steve McCutcheon, Photographer from Anchorage, Herb Hilcher, writer and observer and Alexander Shadura, interpreter. 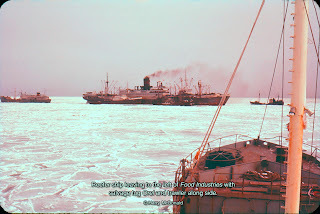 The Commander of the Russian fishing fleet was Paul Alexander Dimedov, welcomed the party aboard. A native of Petropavosok, 54 years of age, and a veteran of 35 years of fishing, he assured us they were only interested in flounder and were not taking salmon, halibut or King crab. 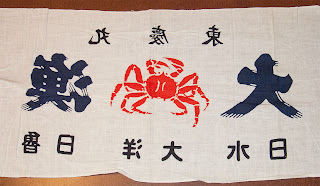 The flounder is a fish that the American have never taken from this area. It was the first time any foreigners had been allowed aboard Russian ships operating off the shores of Alaska and they were welcomed as friends and neighbors. 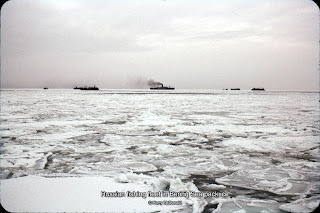 When the ice disappears (in a month or so) the Fleet will move North and west to fish near the Siberian Coast, returning to the Bering Sea the next winter. 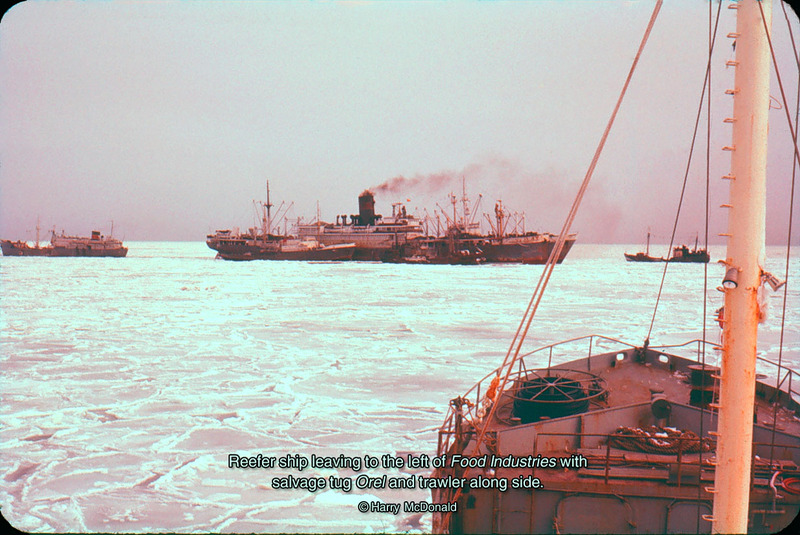 It was Saturday but they maintain Vladivostok time so it was Sunday; their day of rest and practically the whole fleet was assembled. 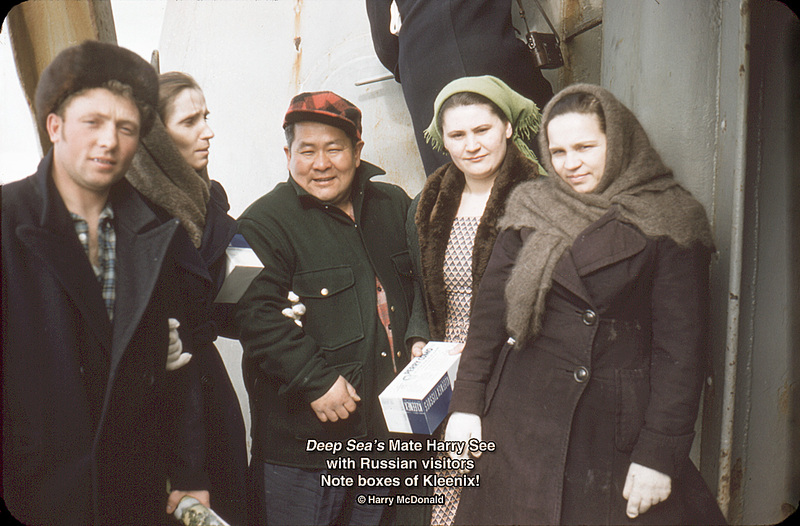 Many women are employed as cooks and domestic help on the reefer ships and the Mother ship. I believe some were seen also on the trawlers. 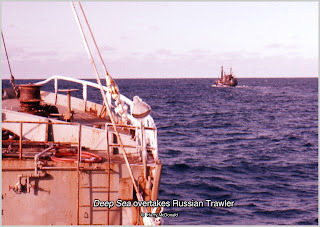 As Engineer of the Deep Sea I was entertained by the Chief Engineer of the salvage tug Orel aboard his ship for dinner and also to see a movie. 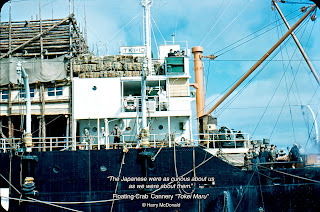 After a day's visit with the Russians, on our return to our base at Akutan, we stopped to visit with the Japanese floating crab cannery Tokei Maru. The ship has been on the fishing grounds off Unimak Island and the Alaska Peninsula since April 16th, and will remain there until mid-July. 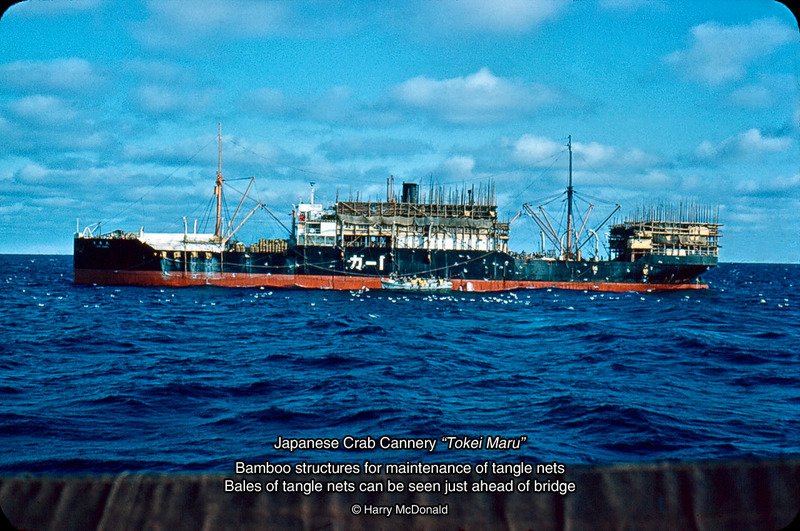 The Tokei Maru is a typical Hog Islander, built as the Schroon in 1919 by the International Shipbuilding Corporation, Hog Island, Pennsylvania. 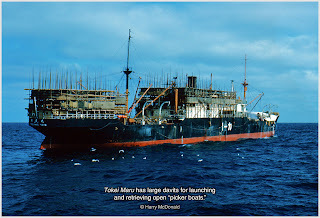 She had several name changes including Brush, Alcoa Master, Aurora Borealis and finally Tokei Maru for Towa K.K. and in 1955 to the Nippon Suisan K.K (where she was refitted to) a crab cannery. 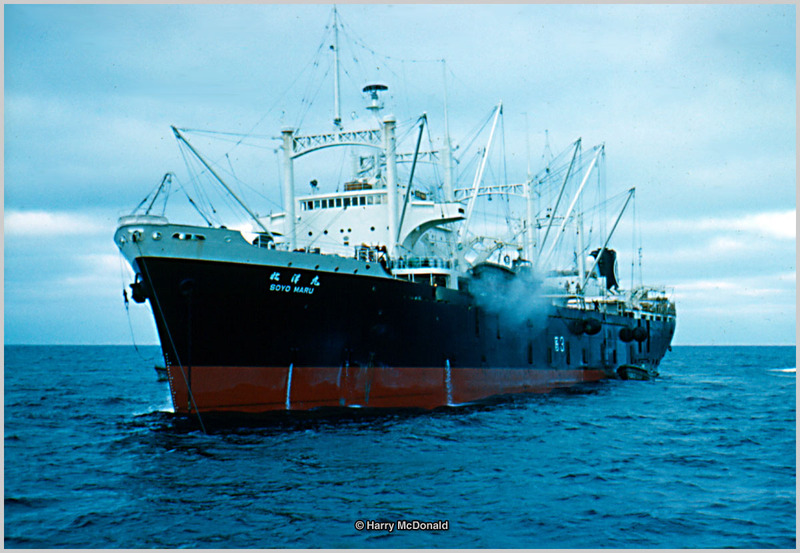 On March 11, 1965, she sank of Luzon Island when a fire broke out on a voyage from Japan to Bangkok and she was later abandoned. 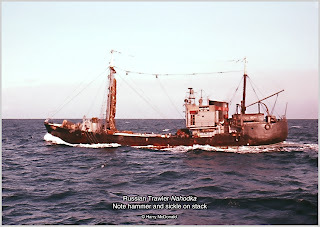 There has existed an old agreement between Wakefield and Tokei Maru whereby the Japanese would stay clear of Wakefield's radar buoys and Wakefield in turn would avoid the Tokai Maru tangle net fields. 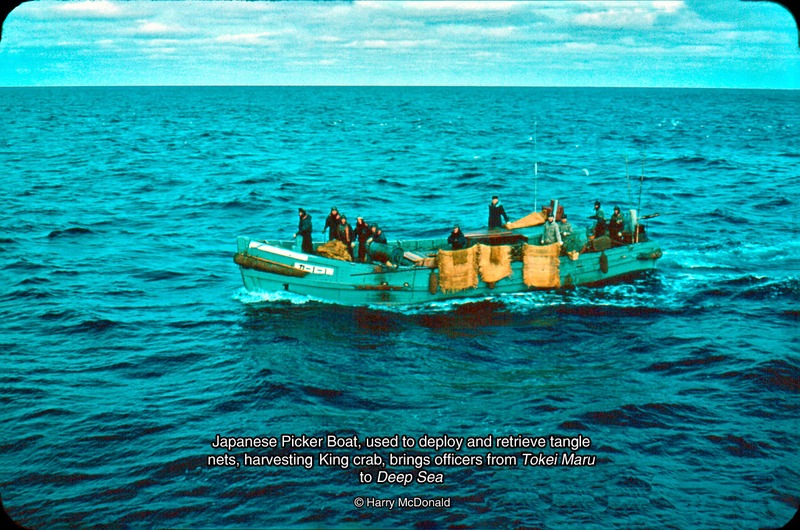 The Japanese use tangle nets, which are made in 200-foot lengths and joined for fishing. 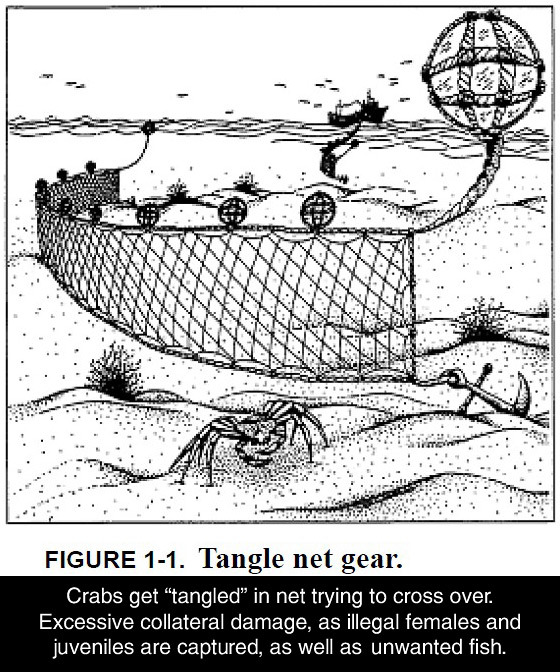 The nets are spaced 300 yards apart and may extend for 15 to 20 miles. 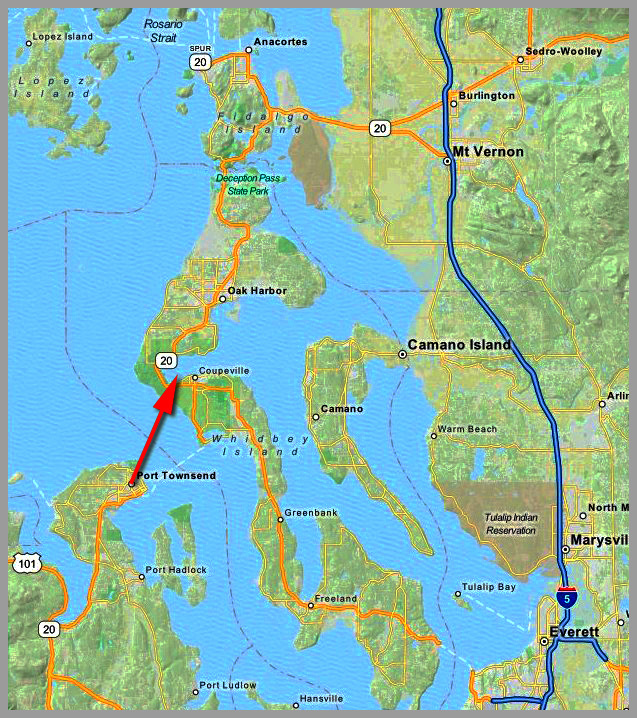 A grid system is fo1lowed and a tang1e net field may cover hundreds of square miles of ocean. 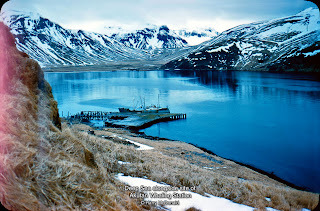 When we returned to our base in Akutan Harbor our traw1ers reported a clash between the American fishing vessels and those of the Russians, who sent there boats into the area where the American had located a huge run of crab. 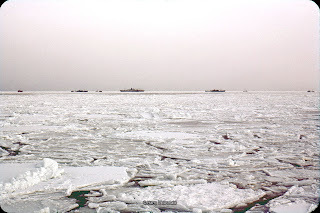 They covered this area with tangle nets, forcing the Americans to abandon their efforts and move away from the area. Ralph Jones, vice president in charge of operations [Wakefield] was sent to talk to the Soviets in an attempt to work out some ground rules which would eliminate friction in the fishery so all parties could operate without interference. 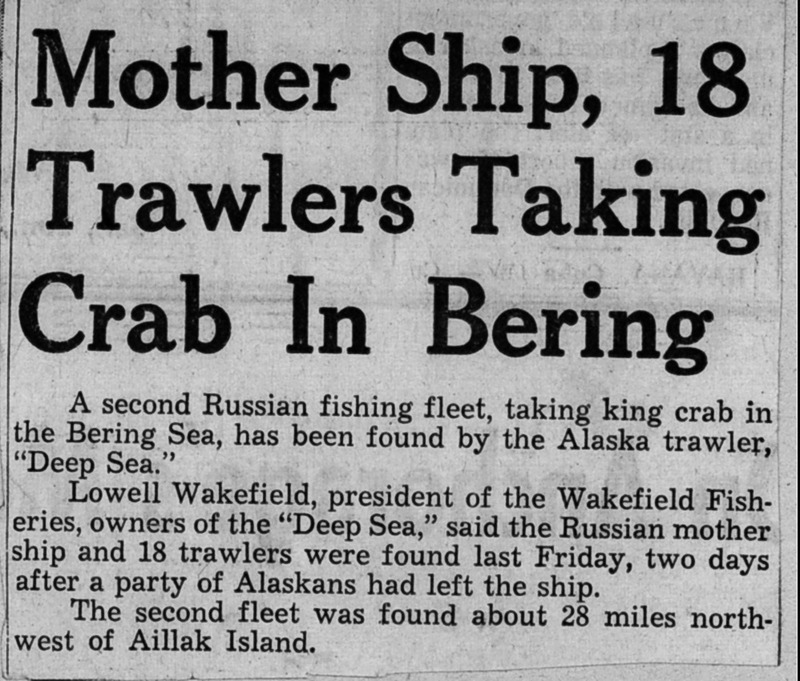 We set out again from Akutan and the Russian crab Mother Ship was located 24 miles off Cape Leontovitch on the Alaska Peninsula after two days of cruising. 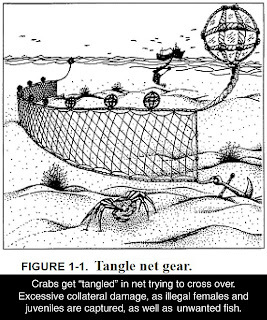 The crux of the problem in the crab fishery is the incompatibility of the methods of fishing used by the Japanese and the Russians using tangle nets on the one hand and the Americans using trawls and crab pots on the other. The interpreter aboard the Deep Sea requested permission of the Soviet Captain of the Mother Ship Soevolod Siberzev to come aboard but was curtly refused. 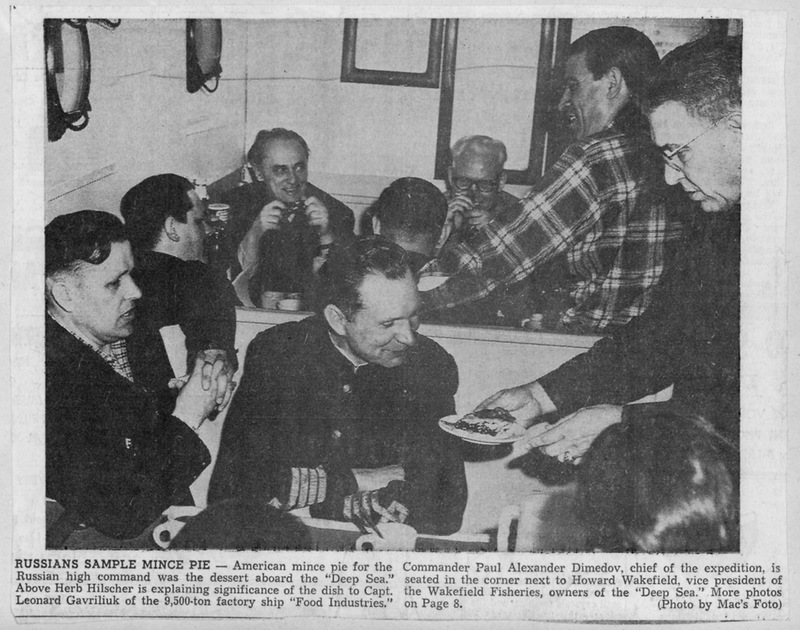 He also refused the invitation to come aboard the Deep Sea and talk with Mr. Jones. The refusal of the Russian Captain to permit American aboard his vessel was a disappointment for the crew of the Deep Sea recalling the warm reception they got when they visited the flounder fleet and the presence of the tug Orel alongside the crab factory ship and that c1inched the matter an far as they were concerned. • Jan 15 - Arrive Trap Point. 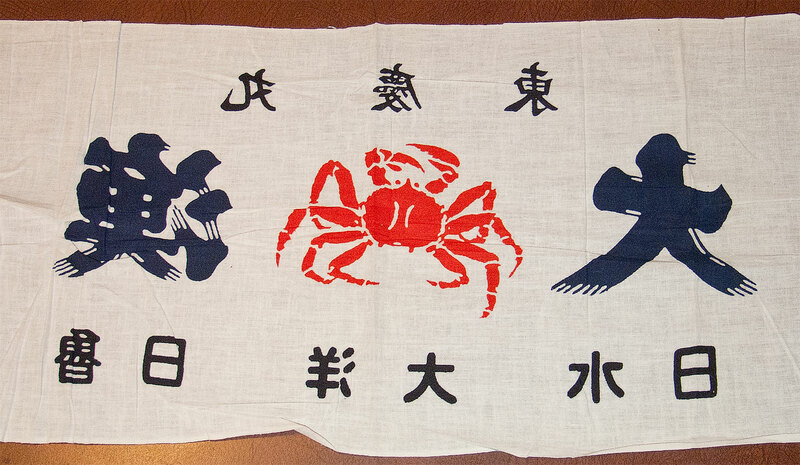 Start processing crab. 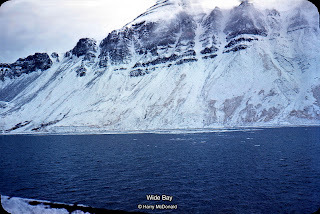 • May 5 - Leave Akutan for Sand Point, Port Wakefield, Seldovia. 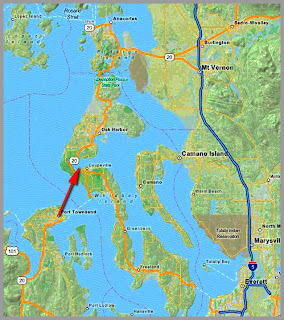 • May 7 - Leave Seldovia. • May 13 - Seattle. My Dad got off the Deep Sea and returned to his more familiar working environment. 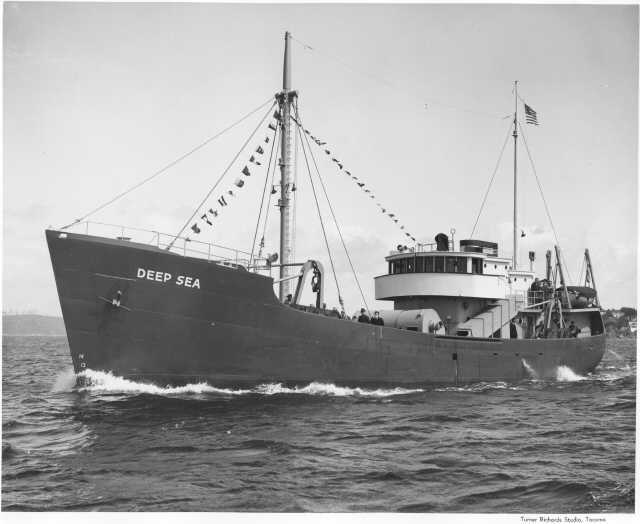 From his sea time notes, it appears he shipped out as Chief Engineer on the Adeline Foss. 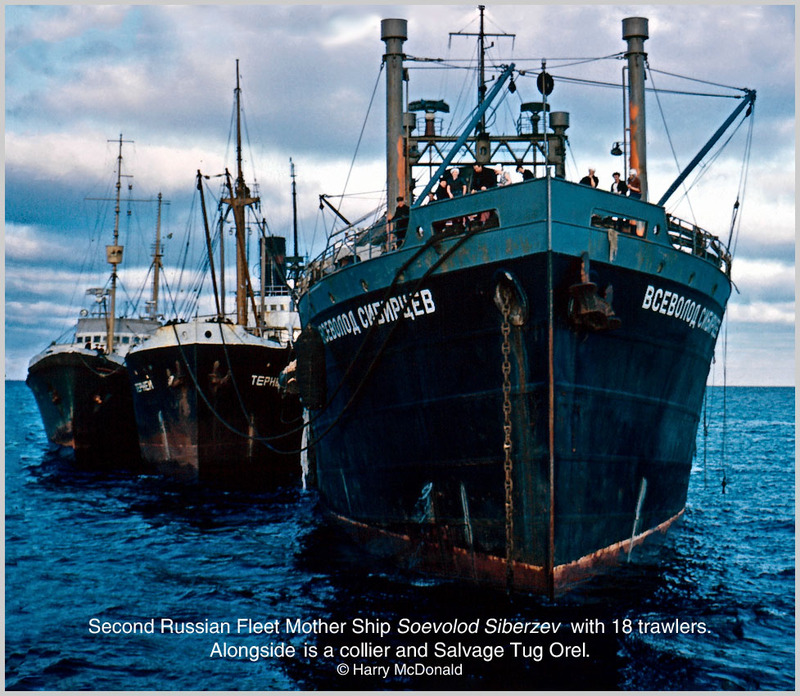 Not included in my Dad's narrative is the fact that the Deep Sea located a sixth fishing fleet operating off the Aleutians. 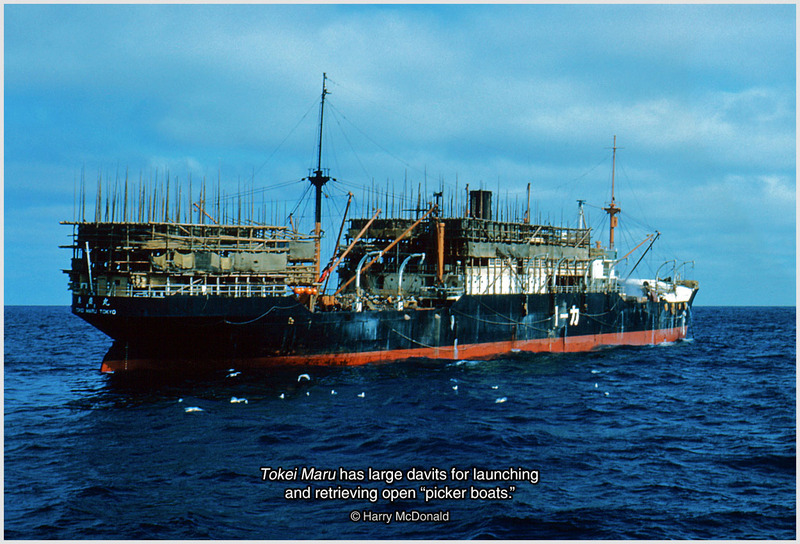 The Japanese factory ship, Soyo Maru, operated by Taiyo Gyogyo of Tokyo, Japan. 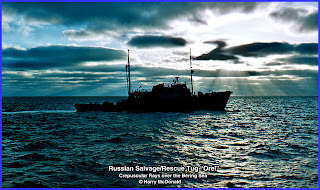 She was located 30 nm NW of Cape Mordvinof, serving as a factory ship for a fleet of 31 trawlers. 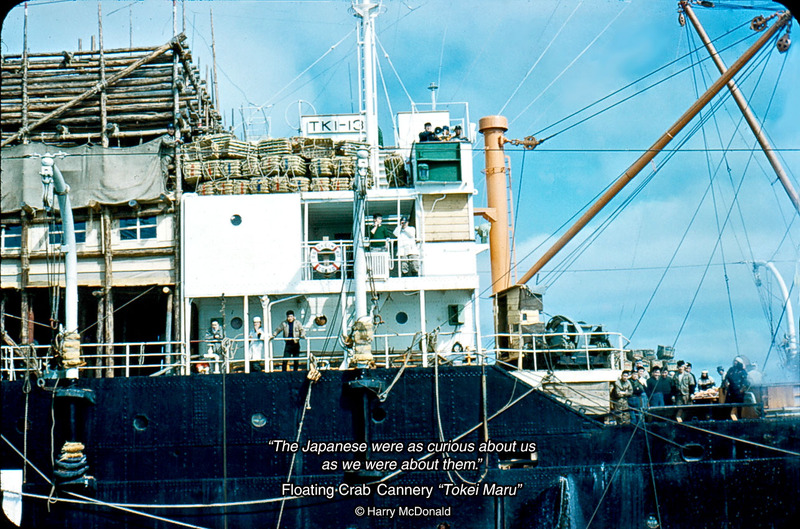 They were harvesting sole to be converted into livestock feed. 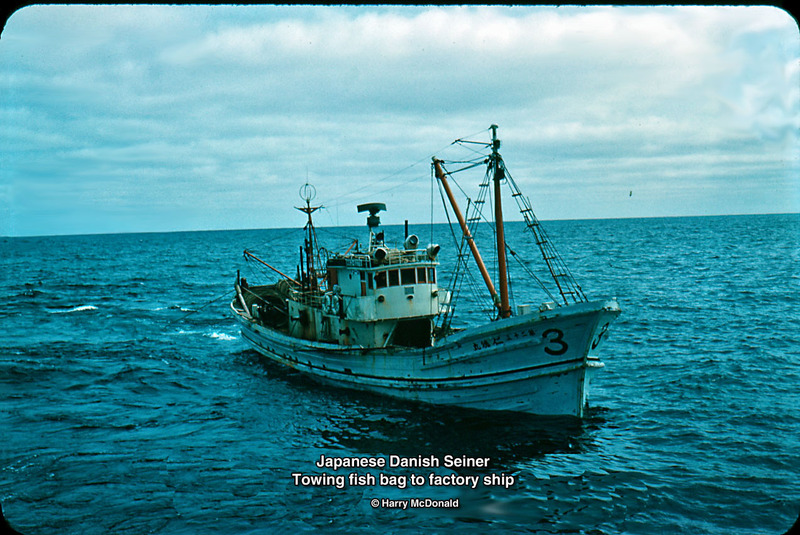 Correctly referred to as Danish Seiners, Danish Seiners are 90 to 150 feet long, 100 to 150 gross tons, and have crews of 18 to 20. 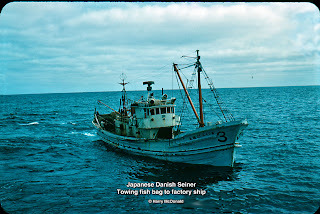 Danish Seiners set the net over the stern and usually retrieve it on the port side. 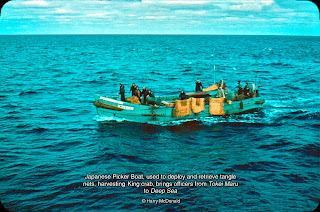 The catch is brailed using a large dip net. Finally, this linen measuring 33" by 13" was found in the back of the scrapbook containing numerous newspaper clippings relating to the "Saga of the Deep Sea." Can you solve the inscription? Please email the solution by using the email link on the right margin of the Blog. 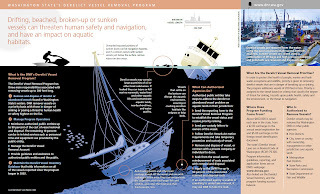 We connect the dots in our fourth and final chapter, "Before the Deadliest Catch: Connecting the Dots"